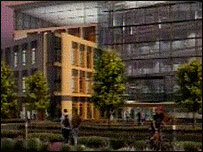 A developer has been chosen to build a £300m hospital in Kent and work is due to start in autumn 2007. Maidstone and Tunbridge Wells NHS Trust said it was a "major milestone" for the Pembury Hospital flagship scheme. Greg Clark MP had raised concerns in Parliament about delays in announcing a preferred bidder for the scheme. The Tunbridge Wells MP said the decision still needed government approval and he would not stop campaigning until building work began. The NHS trust said the Equion Consortium, which comprised three companies, John Laing, Laing O'Rourke and Interserve, would design and build the 512-bed hospital and 42-bed mental health unit. It said the seven-storey development would be the first acute hospital in the country to have all of its single rooms equipped with en-suite facilities. Inpatient bedrooms will have the en-suite door on the same wall as the bed so patients do not risk slips, trips and falls crossing an open floor. Planned treatment and emergency procedures have been separated, in order to reduce infection risk. Maternity and children's services have been combined in a women and children's zone. Inpatient and outpatient facilities have been separated for patients' privacy and dignity. Rose Gibb, trust chief executive, said health chiefs would "continue to work at pace" on the project. Jackie Churchward-Cardiff, Equion project director, said the hospital would set "a new standard for patient care". Plans are due to be submitted early in 2007, with final approval expected in March and construction due to get under way in the autumn. The hospital at Pembury, near Tunbridge Wells, will replace both the existing Pembury and Kent and Sussex hospitals.